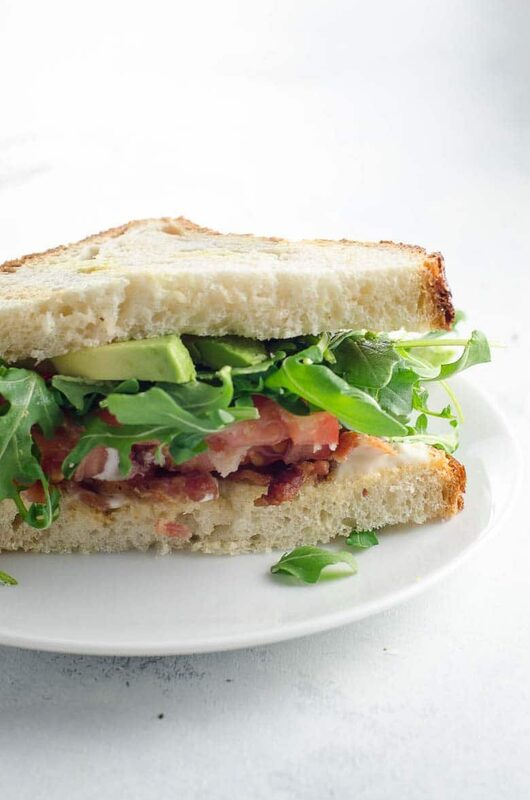 Keep it classic or jazz up your BLT with a handful of arugula and some Kewpie mayo. Everywhere you look these days, there’s a sandwich. Magazines, websites, the radio, those straggler crumbs on your chin from lunch. (You’re welcome.) Maybe it doesn’t concern you to know that there’s a sandwich lurking around every corner. Well. Maybe it should. Sandwiches are sneaky little things. Collectively, they’ve spent generations cultivating an unassuming air, acting nonchalant. “Hey, buddy!” you’ve no doubt heard a sandwich say. “Want to shoot some hoops on Sunday afternoon? Have a couple of beers at the Irish pub after work?” A sandwich wants you to know that its only plans are to chillax with you. So naturally, you wouldn’t hesitate to approach one on a day when you weren’t in the mood for introspection. That’s how the world works. You become an adult, you poke around for a while trying to figure out what everyone else means by “boundaries,” and then one day you realize. There are certain people you go to for soul-baring conversation. With the rest of the world, it’s beers and sandwiches. Every once in a while there’s a complicated case. You twinkle in each other’s vicinity for a short while, then you go your separate ways, each a little wiser. Pretty much by definition, a sandwich should fall squarely into the beers and sandwiches category. We all learned that axiom in middle-school math. 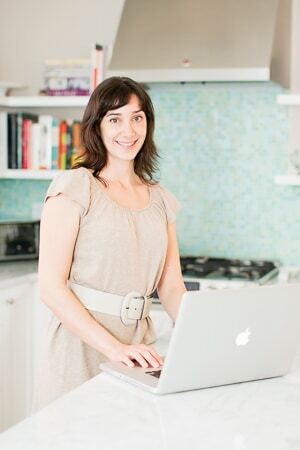 All of that is exactly why you’d be completely justified to find yourself out of sorts — or even a little pissed off — if a sandwich took it upon itself to intervene in your most closely guarded thoughts. A BLT really has no place holding up a mirror to your evolving selfhood, illuminating its core truths. Everyone knows that. Everyone, that is, with one important exception. The BLT apparently missed the memo. And this is where cause for concern arises. It’s true that the BLT carries on its diminutive frame the weight of two countries’ honest histories. 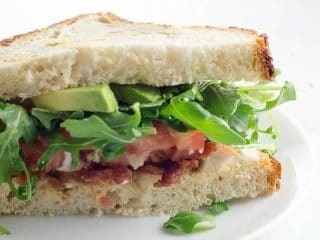 According to Susan Russo’s The Encyclopedia of Sandwiches, the BLT probably derived from Britain’s “bacon butty” into the American classic that has graced humble diner counters and grand hotel menus since the 1920s. So the urge to wax nostalgic in its presence isn’t entirely unfounded. But for some “unknown” reason (namely that I take every possible opportunity to overthink everything, always), in the time it took to toast a pair of retro-sized slices of white bread and fry up a few strips of bacon last week, I’d managed to disrupt several self-truths that I’d always held to be self-evident. I’ve been looking forward to our move to London in July as a way to make my sometimes small-seeming world bigger again. But my BLT questioned whether the size of my world doesn’t have more to do with my “own self” (as the two-year-old would say) than where that own self happens to live. London may be a new beginning, but as people tend to do, we’ll be arriving with our old selves in tow. Theme vs. plot has never been a close call in my mind. So, says the BLT, why the sudden need to disrupt perfectly good lives with a noticeably plot-intensive tale of overseas adventure? WTF, BLT? Cut a girl a break. I don’t know when we became this kind of friends, but if you weren’t such a delicate balance of restraint and indulgence, a perfect specimen of trans-Atlantic evolution, I might just put you down and walk away. But since we both know me well enough to realize that I’d never do that, I guess I’ll just go get a beer. Hint, hint. Simple, classic, perfect: when you want a BLT, there's no substitute. Our version, with avocado, a handful of arugula, and an option for Kewpie mayo, is juuuuust right. Pan-fry the bacon until just crisp. Drain on paper towels. Spread the mayonnaise on one slice of bread and the avocado on the other (or slice the avocado to layer on top). 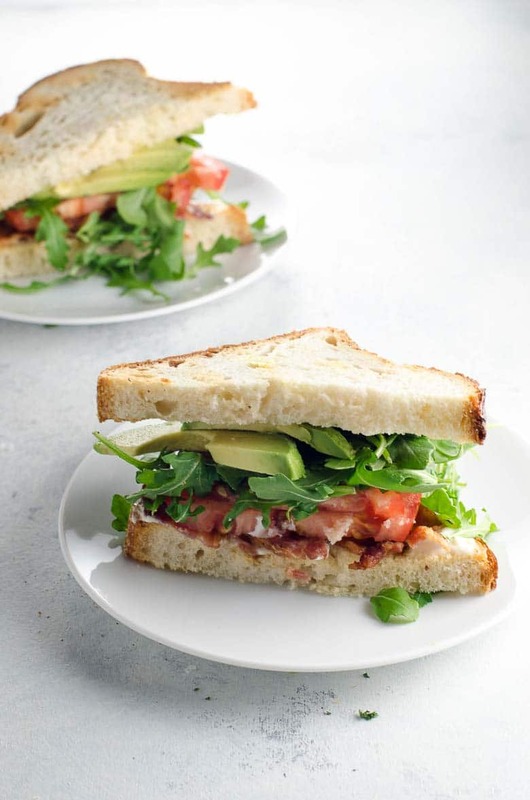 Layer the bacon, tomato and lettuce or arugula on top of one slice of bread and top with the other slice of bread. Cut sandwich in half on the diagonal and serve immediately. Adapted from Susan Russo's The Encyclopedia of Sandwiches.